Dual USB Output. Short circuit protection. Dry location use only. Disconnect AC power when not in use. Unique design fits Wall socket in UK market. (4) Local pick up is not available. Description Only data/sync charging cable can activate quick charging. Note: Quick Charge Technology is not supported by iPhone and iPad. 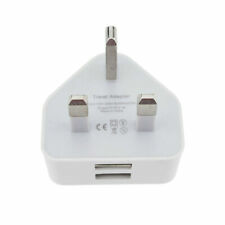 However, they can still be charged at their full speed with other dual USB 2.0 5V/2.4A Port Charger. Specification: ---100% brand new and high quality ---Color: White ---Size: 2.17" x 1.77" x 1.01" ---Plug: UK Plus, US Plug, EU Plug ---Input: AC 100-240V 50/60Hz ---Output: 30W ---2*Smart Charging Port: 5V 2.4A(max) Per Port ---1*Quick Charge 3.0 Port: Output: DC9V-12V/1.5A, DC6.5V-9V/2A,DC3.6V-6.5V/3A ---Compact size and international voltage compatibility (AC 100-240 V) make it the ideal travel companion ---Providing maximum charging efficiency and compatibility for your devices. Features: -- 100% brand new and high quality -- Intelligent technology of the charger can identify any connecting devices and provide the most suitable charging current to ensure faster and more effective charging -- Build-in QC3.0 quick charge technology allow device charging 75% faster than standard charger -- High standard PC fireproof material to protect the internal structure of the charger -- Multiple protection for the charging device such as over current, overvoltage, over temperature, overcharging, and so on -- Easy and convenient to carry and use, you can charge your device with cable plug in -- Suitable for home, travel, office, etc -- Charger only, any other accessories not included Specification: Material: ABS PC case Input: AC 100V-240V(50-60Hz) 0.5A Charging. Dual USB Output. Short circuit protection. Dry location use only. Features: *100% brand new and high quality *Intelligent technology of the charger can identify any connecting devices and provide the most suitable charging current to ensure faster and more effective charging *Build-in QC3. USB port: 2 port. Plug:UK plug. 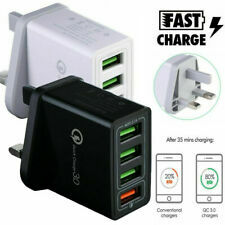 Features: * 100% brand new and high quality * Intelligent technology of the charger can identify any connecting devices and provide the most suitable charging current to ensure faster and more effective charging * Build-in QC3.0 quick charge technology allow device charging 75% faster than standard charger * High standard PC fireproof material to protect the internal structure of the charger * Multiple protection for the charging device such as over current, overvoltage, over temperature, overcharging, and so on * Easy and convenient to carry and use, you can charge your device with cable plug in * Suitable for home, travel, office, etc * Charger only, any other accessories not included Specification: Material: ABS PC case Input: AC 100V-240V(50-60Hz) 0.5A Charging current: 2100mA Outp. USB Wall Charger Mains Plug Adapter for Mobile Phone X 8 Plus 7 6 5 iPod iPad CE. 160 100% Frozen Food Grade Silicone Cube Mini Hot Ice Cubes Silicone Ice Tray. Lingerie Lace Underwear Uniform 1 Set New Transparent Shirt Temptation Suit. Hot Fashion World map Combination Exaggerated Personality New Pendant necklace. Small And Light, Easy To Take Away. Output: DC 5.0V-1A. Input: 100-240V 50/60Hz 0.15A. ★ Features: This all-in-one plug adapts provides power for use in more than 150 countries, so you never need to be at a loss for power again. It allows universal power outlets for laptops, chargers and similar devices and features a safety release button and built-in fuse to ensure safe operation. It doesn’t reduce or convert electrical voltage and is suitable for most consumer electronics ranging from 110V, Max 660W, up to 250V, Max 1500W and USB Max 2.1A 5V dc. This unit only weighs 4 ounces, and measures 65 x 55 x 45 mm (W x L x H). It is CE, UL and RoHS compliant for safety.. Features [Input parameters]: Voltage 110-240V Frequency 50/60HZ [Number of USB Port]: One [Output parameters]: Voltage: 5V (±5%) Current: 2A [Output interface]: Single USB [Power Solution]: Intelligent integrated IC solution with protection [Protection function]: short circuit, over voltage, overload, over current protection [product materials]: to ensure the production of new electronic components [Working temperature]: 0°C~ 50°C No retail packaging to protect environment What's In the Package? ​​​​​​​ 1 x USB Power Charger. 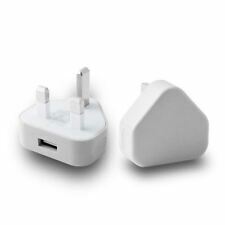 4 Plugs (UK EU US AU). AC plugs can be removed and changed easily by pressing the button and pull out from the main unit. Plugs: US/EU/UK/AU plug. Provides standard USB 5V and max. 2.1A output. Output: 5.0V--4.1A (For USB 6). Compatible with most models which support a micro USB connection. Black Mains USB Adapter Plug - 1000mAh 5v. Short Circuit & Overload Protection. Ending Soon. Genuine CE Safety Approved . General Interest. Add to Favourite. New Arrivals. Plug:UK Plug. High efficiency and low energy consumption. USB port: 2 port. Colour: Black. 2 x 1A USB Charging Ports. Maximum Output: 2.1A. A Universal Serial Bus, USB, is used in nearly every mobile device, thanks to its compatibility with different systems and ease of use. In most households, the numbers of USB-based devices are more than the number of USB charging ports. Therefore, it is worth buying a USB charger adapter on eBay to keep all your devices charged. What features should you consider when buying a USB plug adapter? The number of ports: Plug adapters come with one or more ports. You should opt for an adapter that can serve as many devices as possible. Amperage and voltage: The power delivered by the USB charger adapter should match the charging specifications of your device. USB charger version: The common USB charger speeds are USB 2.0, USB 3.0, USB 3.1, and USB C. USB 3.x is also known as super-speed and is denoted by an SS (double S) close to the port. Which adapter is suitable for your device? Certification: Ensure the adapter has the CE mark or other quality certification based on the country of origin. Avoid bargain-priced new adapters: When it comes to electronics, it pays to invest in a good-quality new charger or adapter. Opt for trusted brands: Choose a phone-specific adapter or stick to proven brands. Do you need a separate adapter for a smartphone and a tablet? A phone charger draws less power than a tablet charger. Consequently, it will take more hours than usual to charge a tablet when using a charger designed for a phone. However, most modern phones can handle a high charging power. What is the difference between USB on-the-go (OTG) and USB hub? A USB hub, based on the specs, can serve both as a charging adapter and for data transfer and is compatible with most devices. USB OTG, on the other hand, is a unique device that allows sharing data only. Again, not all phones are USB OTG compatible.